For any experiment, a plan is required. This is more formally called the Experimental Design. Included in that, is the timeline and what actually will be measured. Of great importance to the plan is how variation from random effects, or things we don’t care about, will be controlled to a minimum. For example, all the queens will be mated and kept in one location so that different locations will not effect the results. 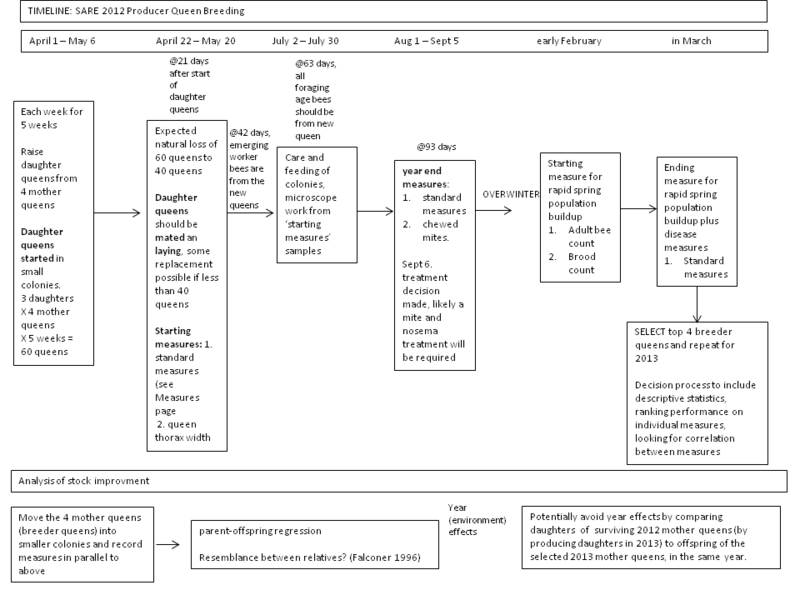 Here is the timeline for bee breeding in 2012 and 2013. The outline will be repeated for each year. Click on the image for a larger view. The time of year that the colonies will be started will also introduce variation in the results. It won’t be possible for me to start all 40 colonies in the same week, therefore I will start some colonies from each of the four mother queens each week. If I instead started queens from a different queen each week, there would be a four week difference in resource opportunity and available drones for mating in the first and fourth queen. That would not be good. The timeline above looks really good on paper, but when working with bees, or any other animals, things happen and things change. Its important to be able to be flexible and still have a reasonable control over unexplained variation. Here are the measures I'm interested in for selection. Click on the image for a larger view. When raising queens with the grafting method, I have batches of about 20-30 queen cells ready to hatch once a week. With grafting, its best for me to either raise queen cells on a weekly basis until I want to stop, or don’t bother. Once I’m set up and going, its time consuming to stop and start again. If you don’t bank virgin queens, queen cells must be placed in mating nucs after incubation on day 10 after grafting. That means, you have 1-2 days before ‘day 10’ to split hives for mating nucs and if the weather is rainy or there is an emergency at work, too bad it must be done. Unless, you instead cage the cells so they emerge caged in a queen bank. They can remain banked for up to one week and placed in mating nucs at your ‘leisure’ 🙂 . Dr. Larry Connor recommended this in his course, and I think he is right. Queens that have emerged in a queen bank. The 'candy cap' for the hair roller cages can be used to hold capped queen cells instead of candy. Do place some queen cage candy at the bottom of these cages so the queen has her own source of food. For a queen bank I use the cloak board method which will be described in another post. 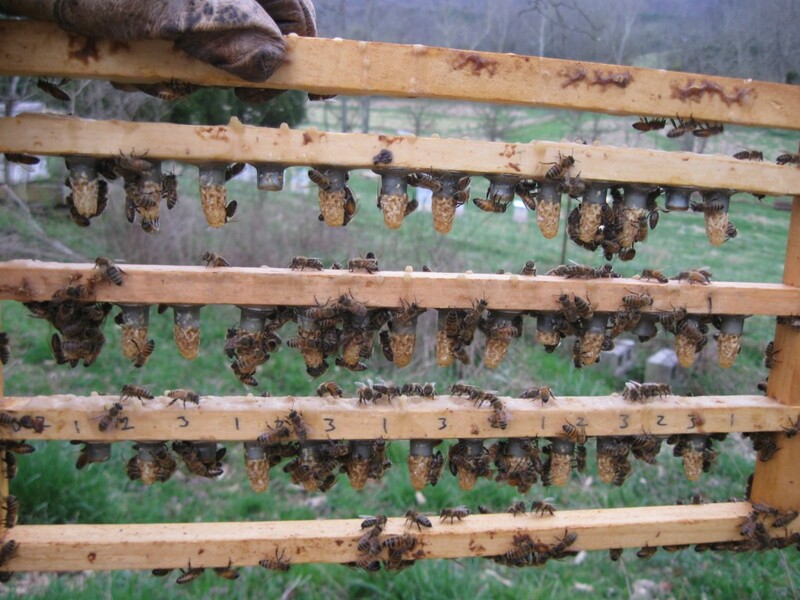 Once virgin queens are banked, they need to be introduced into mating nucs within about one week. Otherwise, they will be too old to be mated properly. I graft cells on the same day each week. This means I can have fresh, banked virgins ready to go any day throughout the season when I have the time (and weather opportunity) to split some hives or when I find a queenless hive that needs a queen. Virgin queens should be introduced into mating nucs caged, just like a mated queen. Round two worked well too. 39 cells took out of 42 grafts. All look decent. Both my first and second graft in 2012 had better success than any grafts in previous years. Was it the change to plastic cups, years of practice, perfect weather, or just an exceptional cell building colony? There are lots of factors that influence the success of a queen graft. More is involved beyond being able to move worker larvae from its comb into an artificial queen cell cup. And much more is involved in getting these queen cells hatched out, mated, and laying in new colonies. Making splits, nucs, or colony divides is one of the prerequisites to rearing queens so that you can get those queens mated and heading new colonies. Here's the second graft of 2012. Looks like I've got lots of splits to make. I'll need to make a queen bank to give me time to make some splits. I pulled this graft out of the builder at 5 days after grafting and moved them to the incubator. All cells were capped. I pulled my last batch at 4.5 days and I had a few cell still not finished. So waiting till 5 days after the graft is best. At the same time, I do the maintenance manipulation on the cell builder. I’ll talk about that later. The cool thing about plastic queen cell cups is how you can see how much royal jelly the queen larvae have. Its the white material at the bottom (or in this case top) of the cell. Once the virgin queen emerges, you want to see some royal jelly left over, indicating that there was more than enough food to feed her as a larvae. Click on the pic to zoom in. So, why am I trying to breed better bees? Losses in managed honey bee colonies have increased in recent years with a phenomenon called Colony Collapse Disorder (CCD). It has become a consensus that multiple causes are responsible for CCD events and many of those causes are related to issues with the parasitic varroa mite and a gut parasite called Nosema. These problems are not new, but several other confounding factors may be, and these together have lead to a general decline in honey bees irregardless of specific losses where the symptoms have matched CCD events. With this understanding, it is now more appropriate to address bee decline in general, as opposed to CCD. 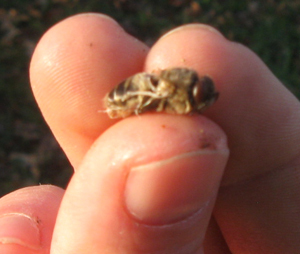 Here is a drone honey bee that died from Deformed Wing Virus (DWV) before it emerged from its brood cell. Varroa mites transfer DWV virus. You can see the resulting shriveled wings from the virus. One way to improve honey bees ability to handle factors in bee decline, is to breed bees resistant to mites. Over the last several decades, major advances have occurred in breeding bees to be resistant to varroa mites by selecting for hygienic behavior. Hygienic, mite resistant bees are being propagated and distributed through many bee breeding programs including the USDA-ARS Varroa Sensitive Hygiene (VSH) bees. However, few of these programs have incorporated selection for nosema disease resistance in parallel to mite resistance. In addition, bees produced in these programs may be adapted to their specific location or conditions not shared by all beekeepers. I may be able to better adapt the bees I use by selecting within my own environmental and management constraints. “Locally adapted bees” is a concept with renewed interest in today’s challenging beekeeping environment, yet this concept has been appreciated for some time as identified by Brother Adam in Beekeeping at Buckfast Abbey. Nosema disease can prevent colonies from growing strong. Here is a weak colony in spring. Nosema disease is caused by two species of microsporidia, Nosema apis and Nosema ceranae. These unicellular organisms reproduce inside adult honey bees negatively affecting the mid-gut epithelium, hypopharyngeal glands, corpora allata (juvenile hormone), as well as oocytes in queens (see Huang’s article). Nosema infected bees have a shorter lifespan, dysentery, nutrition digestion problems, cannot produce essential hormones correctly, and in many ways cannot function to maintain productive or surviving colonies. The microsporidia produce spores in infected bees and after defecation, these spores are picked up by un-infected bees to continue the disease cycle. Nosema disease is normally controlled by feeding the antibiotic fumagillin dissolved in syrup during spring and fall. Breeding for disease resistance and increased production should hopefully result in fewer colonies like this one in spring. A colony that has not grown more than this by March in Tennessee is not worth trying to revive. Treatment is normally done without prior sampling to determine if Nosema spore levels are high enough to warrant treatment. In the past, there was a single species involved, Nosema apis. Now, a new Nosema species in U.S. honey bees, Nosema ceranae, causes much more problems than previously observed. This may explain why nosema disease resistance has not already been incorporated into many large scale, historic breeding programs. Spore sampling for Nosema requires microscopic examination of bee samples and could possibly be used as a selection measure. With the exception of formal bee breeding programs, many beekeepers raise queens from colonies that seem to do well as compared to other colonies. Specific measures are often not incorporated, likely due to the time involved in sampling. Nosema disease is an impediment to Organic Production and Certified Naturally Grown honey bees. Formal recommendations by the National Organic Standards Board to the National Organic Program in 2010 point out that antibiotics are not permitted for any type of livestock (see .pdf). It is unlikely the antibiotic fumagillin will ever be included as an allowed organic substance. Fumagillin is also prohibited for use in Certified Naturally Grown production. There are numerous essential oils on the market for control of nosema disease, however none of these have been shown to work. More sustainable than using annual, preventative treatments, would be if the bees could normally handle this disease on their own. There is some evidence that resistance to Nosema by honey bees is a heritable trait and therefore breeding for that trait may be effective in reducing or eliminating prophylactic nosema treatments. My first graft of 2012 occurred on March 11, 2012. That’s about the same time I started last year. The bees are just a few weeks ahead of where they were at this time last year, but wow, it is so much warmer this year. We have had frequent rains this year, which slows them down just as much, if not more, than cold night time temps. Last year, all the queens from my first graft froze in their mating nucs, mostly due to user error. This year, I’m going to introduce caged virgins to start and see how that goes instead. If it gets cold (seemingly unlikely, but I’m from here and I know how the temperatures can shift), they will already be emerged and more hearty. Plus, if it works out well, introducing virgins will work out with my ‘working man’ schedule much better than the strict schedule required for introducing queen cells into mating nucs. So that means my next blog post will be about setting up a queen bank for the cells to emerge in and be taken care of for a day or two while I make up splits. Here is the first graft of 2012. 32 took out of 40. Just a few are too small. Not bad if I do say so myself. For a cell builder hive, I like to use the cloak board method for a queen right cell starter/finisher. After the picture above was taken at 4.5 days after grafting, I moved the cells into a queen cell incubator in my house. This is a good practice just in case a virgin gets loose in the cell builder. If that happens, the cells could get torn down a day or two before they emerge. When I remove the cells, it is convenient to also prepare the cell builder for my next graft by moving young brood above the excluder/cloak board, and add empty comb below for the queen to lay in, and check for queen cells that need to be removed from other frames in the cell builder. None were present at this date. I’m pleased to announce a honey bee breeding project I will begin in 2012 on my farm. The Southern Sustainable Agriculture Research and Education (SARE) arm of the USDA has agreed to fund a 2 year project on my farm to improve honey bee stock. In my next few blog posts, I’ll go over the details of this project, then I’ll provide updates as the seasons progress. So, lets begin with a little background info about my farm and SARE! Daughters of Carniolan queens from Glenn Apiaries will be the base, starting point for my SARE breeding project. 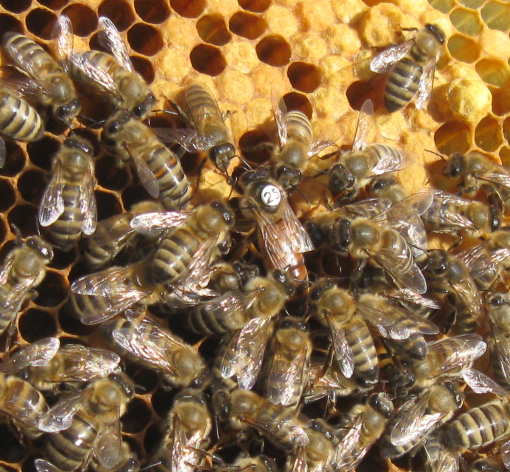 These queens are Carniolan and bred with Carniloan drones. The Glenn’s have crossed Sue Cobey’s line of Carniolan bees (including some germplasm from recent imports) with VSH bees (Varroa Sensitive Hygienic) to produce the Glenn Apiaries line of Carniolan bees. These bees are a dark bee known for being winter hardy, capable of rapid spring build up, and have strong tracheal mite resistance. Since the Glenn’s have already crossed these bees with VSH and the drone producing colonies these daughters will mate with at my mating yard are daughters of pure VSH queens, the progeny produced during this project should have good varroa mite resistance. I have been in the business of beekeeping since 2006 and have been a beekeeper since 1999. I keep between 60 and 100 colonies at 5 apiary sites in East Tennessee. I have raised queens from various stocks and currently utilize queens from Glenn Apiaries. As excellent as some of the offspring of these queens are, it is reasonable to believe that my location is very different from where these bees were originally bred and breeding bees for my own location and needs will be advantageous. SARE has been a major influence and supporter of my beekeeping farm and my education. Through relatively small grants, SARE can encourage people like myself whom want to improve farming to do so while keeping the risks associated with the costs of trying things down to manageable levels. In exchange, I will try and convey what I learn to others to repeat, or avoid, or simply add to your knowledge base. AND, ideally I’ll be helping to improve disease resistance and economic improvements of honey bees used in or near Tennessee, since most of my queens sold are within a 1/2 day driving distance. 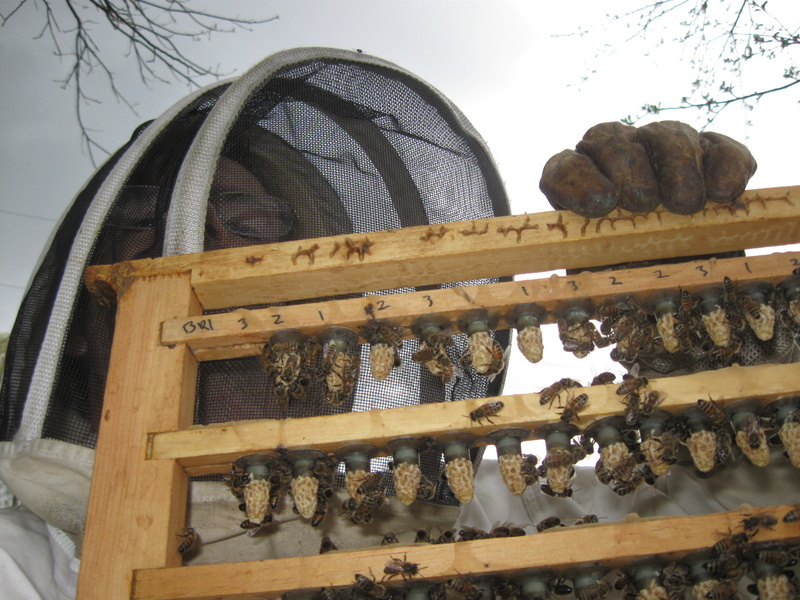 From 2007 – 2009, I conducted a SARE producer project to test a beekeeping practice of natural comb management. I learned and shared that ‘natural comb management’ is not for me, and likely many other beekeepers that have similar needs. I also learned that drone producing colonies don’t necessarily have more mite problems than colonies where drone production is restricted by worker sized comb cells. This is opposite of the conventional thought on drones and varroa population growth. Want to learn more about what SARE does? Check out their news feed below. In 2009, I finished up a SARE (Sustainable Agriculture Research and Education) producer project to investigate what happens when you don’t use foundation in honey bee colonies. I did this with the help of the Anderson County Beekeepers Association. Below is the report I sent to SARE in 2009 along with some value added extras. 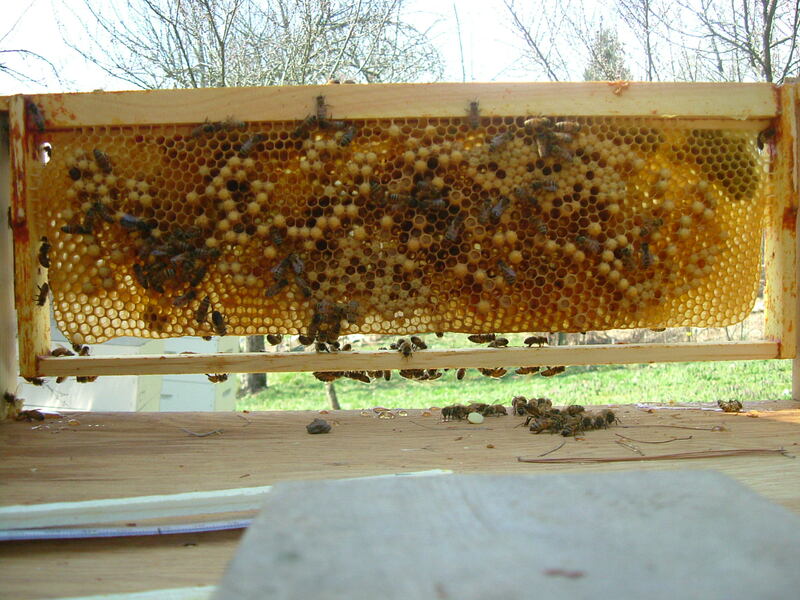 Bees building comb from a waxed, wooden starter strip instead of pre-stamped foundation. In this frame, they are building drone sized cells and storing incoming nectar..
At two locations, beehives were managed with wooden starter strips instead of standard 5.4mm foundation by turning the wedge of a ‘wedge top’ frame on its side and applying a bead of wax. Doing this provides a guide for the bees to build comb from the top of standard frames. Foundation is a sheet of wax with hexagonal cells imprinted on the sheet to create a guide, throughout the entire frame, for the honey bees to build their comb. The colonies in which foundation sheets are not used are called ‘natural cell’ colonies as the sizes of the cells they build are ‘natural’ instead of being influenced by foundation cell sizes. We intended to test the idea that a standard 5.4mm foundation cell size alters the biology of honey bee colonies in a way that is detrimental, as it relates to parasitic Varroa mite populations. As a part of this idea, some beekeepers buy 4.9mm foundation, with the idea that this size is more ‘natural’. Since Varroa destructor mites only reproduce on pupating honey bees in their cells, it is reported the size of the comb cells may influence the mites’ ability to reproduce. EXTRA: Where did the cell size of standard foundation come from? European honey bees. There is some feeling that today’s standard foundation size is the result of industry adoption of Boudoux’s bee enlargement experiments (Osterlund 2001). Boudoux (1933) promoted artificial enlargement of bees for increase honey yield. However, Boudoux (1933) promoted the use of very large foundation, 700 cells per square decimeter (dm), where modern foundation is much smaller, closer to 850 cells per dm. The more cells per square decimeter, the smaller the size of the cell. When A. I. Root made his first foundation mill in 1876, it was stamped at 5 cells per inch, or cell width of 5.08mm (Root 1975). He later decided this was slightly too small because bees would sometimes build larger, natural comb over the foundation imprints. After measuring natural combs, he decided 19 1/3 cells in 4 inches was the proper natural size of worker cells (which converts to 5.26mm/cell) and made foundation based on this size, which was then adopted by the beekeeping industry (Root 1975). This is practically the same size as the modern foundation used in this test (5.3mm ± .004). Many beekeepers report that commercial foundation is 5.4mm, but every sheet I have measured has been 5.3mm, not that I think such a small difference would matter. Modern measurements of European honey bee worker cell size in naturally built comb include 5.2mm (Seeley and Morse 1976), 5.2mm ± .457 (Taber and Owens 1970), and 5.2 – 5.4mm (Spivak and Erickson 1992). Modern commercial foundation is based on the natural cell size of European honey bees. However, there are many sub-species of honey bees in their native lands of Europe and Africa. These sub-species have varying natural cell sizes. It is known that bees build cells consistent with their genetic origin and do not construct natural cells based on what they are raised in (Spivak and Erickson 1992) Africanized honey bees naturally build smaller combs. It may be that some European sub-species, not commonly represented in the U.S., may have smaller natural cell sizes.. Cowen (1890) measured Apis mellifera mellifera to have a worker cell size of 1/5”, or 5.08mm, but he reported that Apis mellifera carnica cells were slightly larger. McMullan and Brown (2006) found Apis mellifera mellifera colonies had no problem transitioning from standard sized combs to small cell foundation 4.9/5.0. The bees used in this SARE study were of Carnica and Liguistica descent (Carniolan and Italian), the most common European honey bees in the U.S. If you were to repeat this study with Africanized bees, or possibly even bees with a strong percentage of Apis mellifera mellifera (the german black bee), I would expect the bees to build smaller combs. Medium frame nucs from foundationless colonies were placed in new boxes. For the next two years, colonies built new combs as previous year’s combs were removed. At location 1 (Michael Wilson), in spring 2007, ten colonies were started from splits of natural cell colonies begun in 2006. Each colony split consisted of 5 medium frames of comb which included the approximate ratios of, 2 frames of brood, 1 frame of pollen, 1 frame of honey, and 1 empty frame. Each colony split also had about 4 frames of bees and a new Carniolan-Italian hybrid queen acquired from the same supplier the day before. In the five control colonies, standard 5.4mm wax foundation was provided in frames and the colony was built up to 3 medium boxes. Five natural cell colonies were established using frames with wooden starter strips instead of foundation. Once these colonies were built up to 3 medium boxes of comb, the original 5 frames of the splits were removed and replaced with frames of foundation and starter strips respectively. Therefore, by fall 2007 all combs in the hives was newly built. Cells were measured by averaging the width of 10 cells in a row. I took 933 measurements on either foundationless, standard foundation, or small cell foundation. 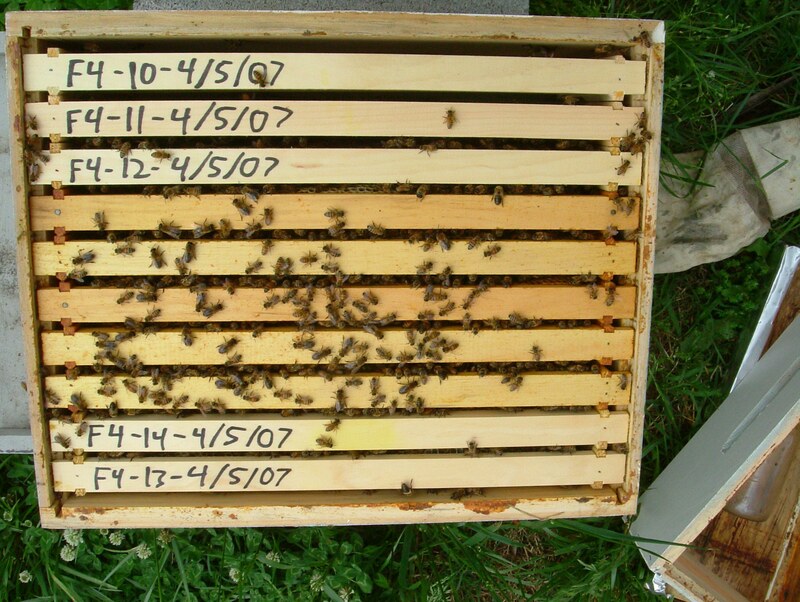 In 2008, these ten colonies were observed another year, while ten new colonies were made from splits of these hives. All colonies were again given new queens from the previous supplier. While making new colonies, frames were removed from the 2007 colonies to populate the new ones. 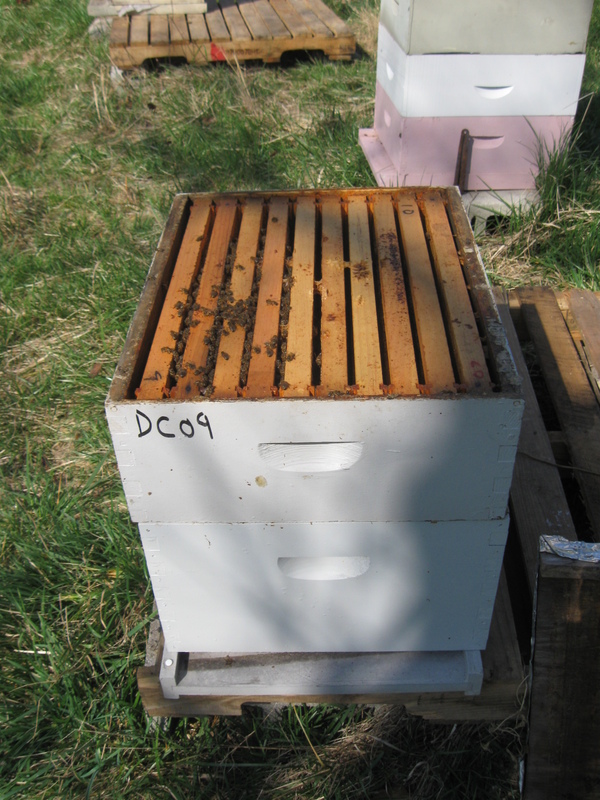 New frames were used to replace the ones removed and thus a third year of comb was built without the influence of foundation in natural cell hives. The ten group 2008 colonies were split from their respective control and natural cell parents in the same matter as colonies started in 2007, except this time natural cell colonies were given 10 frames of 4.9mm foundation per colony in addition to starter strip frames. The ten group 2007 hives and ten group 2008 hives were again allowed to build up to 3 medium boxes. 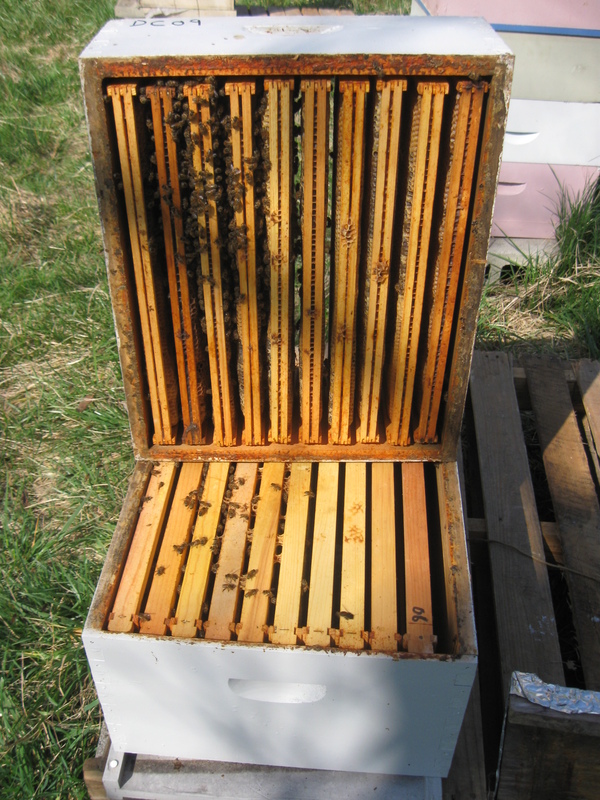 When applicable, honey supers were provided above a queen excluder with drawn comb and foundation to provide an area for harvestable honey. The strength of the hives, surplus honey, worker cell size, Varroa mite populations, and percentage of drone comb as compared to worker comb was recorded. The strengths of the hives were measured a number of ways. 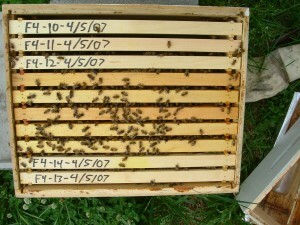 In spring 2007, the rate in which the new colonies built comb was recorded. 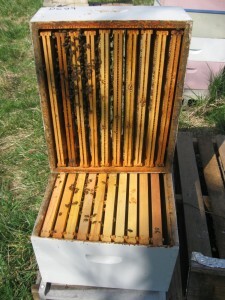 As described by natural cell beekeepers, empty frames were moved into the middle of drawn combs to encourage comb building. Every 10 days, this manipulation was done in all ten colonies and the percentage of drawn comb in each group was recorded. Surplus honey was recorded as numbers of frames of honey removed from supers. Worker cell sizes were measured by placing a metric ruler over the cells and measuring 10 cells. Dividing this measurement by ten made one observation of cell size. One to four cell size observations were made for most worker bee frames built in 2007 and 2008 for both natural cell and control colonies. Varroa mite populations in the beehives were recorded as 24hr natural mite fall averaged over 3 days. Natural mite fall is used as a method to record Varroa mite populations. A wood frame with screen on the top and a sticky, plastic shelf liner underneath is slid into the entrance of the hives. Any mites that fall off bees or from the comb go through the screen and become stuck to the shelf liner material. After three days, the screens are removed and mites counted. This was done roughly once every 4-5 weeks with longer intervals during winter months. Percentage of drone comb per colony was also measured. Combs in which honey bees raise drones (males) are visually larger then cells built for raising workers (females). It is understood that exclusively providing 5.4mm foundation in each frame suppresses the amount of drone comb built by colonies. Bees often build drone comb on frames without worker sized foundation. Varroa mites are more attracted to drone comb and can be removed from hives after these cells are capped. At another location (Larry Chadwell), 10 hives were started in 2007 from standard foundation hives. Five colonies were again developed on starter strips, while the other five were on 5.4mm plastic foundation. These hives were kept for 2 years and allowed to build up to two deep box hives, instead of the three smaller medium boxes used at Michael Wilson’s location. At this location, the deeper frames of the hive boxes seemed to cause problems. Larry Chadwell took the project in a different direction at this point. Learning from the comb building activities of hives without foundation, a method called “drone comb trapping” was used in a way to take advantage of the bees desire to build drone sized cells when not given foundation. This technique is well proven to reduce Varroa mite populations. Varroa mites are highly attracted to drone pupae over worker cells and honey bees like to have a certain amount of drone comb in their hives. When a beekeeper provides empty frames in colonies with only combs built from standard worker size (5.4mm) foundation, they will build drone cells. These drone combs are then removed when the drone pupae are capped and the combs, with Varroa mites inside, are destroyed. In this picture, the bees are in medium sized boxes. Three mediums are sometimes used as an overwintering configuration. At the location where bees were kept in only medium sized frames, natural cell colonies were easier to manage. At the other location, bees were in all deep size boxes. The foundationless bees had trouble moving up to build comb in the deep sized boxes. Combs built in the upper deep often did not conform to their frames. Drone comb trapping is often described as a labor intensive technique primarily suited for hobby beekeepers. Larry Chadwell keeps about 100 hives, which is considered large scale for our area. He decided to try out the feasibility of drone comb trapping on the large scale of 100 hives. Data collection was initially conducted on his natural cell trial hives, but it was halted after the initial poor performance of natural cell colonies. Data collection on the 75 hives in which drone comb trapping was being used was not possible in this study. However, Larry Chadwell’s experience and opinion of the feasibility of large scale drone comb trapping and the usefulness of natural cell beekeeping was recorded during an interview by Michael Wilson. The results are separated between Michael Wilson and Larry Chadwell’s location. 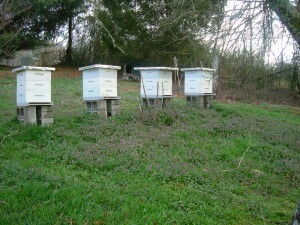 At Michael Wilson’s location, hives were grouped as 2007 hives and 2008 hives depending on when the colony was started. Five control and five test hives were in each group. During the first year of both groups, mite levels did not significantly differ. However, during the second year of group 2007 colonies, mite levels were significantly lower in natural cell hives (60 ± 11, mean ± s.e.) than in control hives (114 ± 22; P = 0.0004). Despite these lower numbers, hives in both groups surpassed economic thresholds and experienced colony death. The mean peak mite levels in natural cell colonies reached 162/day, while in control colonies they reached 278/day. The economic threshold is considered to be between 59-187 (Delaplane 1999 Apidologie 30:383-395). By the end of the study, across both group 2007 and group 2008 hives, 5 out of 10 control hives and 5 out of 10 natural cell hives died, likely to varossis. Here I graphed mite drop on the test and control colonies that were kept 2 years and the test and control colonies that were kept only in 2008 (in blue). Foundationless colonies are the dotted lines. The arrows show colony strength measures. The only colony strength measure significantly different was surplus honey, the red arrows. The reason for the lower mite levels in the 2nd year of group 2007 hives appears unrelated to worker cell size. Control colonies in both year groups had a worker cell size of 5.3mm ± .003 (mean ± s.e., n = 531) while natural cell colonies had a worker cell size of 5.4mm ± .007 (n = 437, P ≤ 0.0001). Cells of natural cell colonies did not decrease in size between 2 years (2007) and 3 years (2008) of management without foundation. 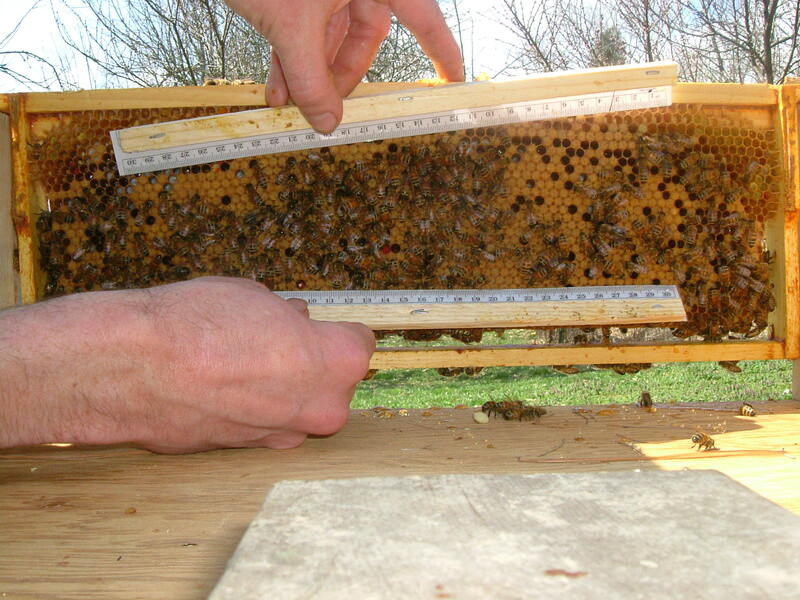 The worker cell size of comb on small cell (4.9mm) foundation placed in group 2008 hives was 5.5mm ± .02 (n=96). The bees ignored the cell imprints on the small cell foundation and built either drone cell sizes, or worker cell sizes close to 5.5mm. It is difficult to say if the strength of 2nd year, group 2007 control colonies could account for the higher mite counts. Colonies with higher bee populations will have more mites. 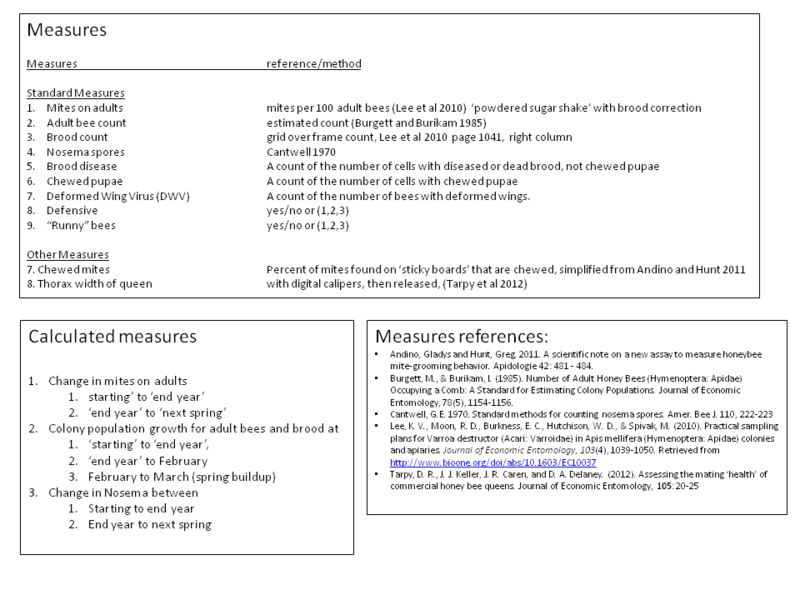 The average strength of group 2007 colonies did not significantly differ when measuring the rate of comb building in spring 2007, the hive weight in summer 2007, and the area of bees, brood, pollen and honey in the brood chambers during spring, summer, and fall 2008. However, significantly more comb was built by control colonies (100% ± 0, mean ± s. e.) as opposed to natural cell (87% ± 5.78; P = 0.0492). This trend is also seen in honey production. Significantly more surplus honey was produced by control colonies (25.4 frames ± 3.9, mean ± s.e.) over natural cell colonies (5.4 frames ± 3.5; P = 0.0052). This difference may be related to the greater amount of drones produced by natural cell colonies. Due to the timing of data collection, a difference in the amount of drones between the two groups was not measured, however a difference in drone comb was measured in natural cell colonies (33% ± 3.5%, mean ± s.e.) as opposed to control colonies (1% ± 0.2; P ≤ 0.0001). Plentiful drone production was observed in the second year of group 2007 natural cell colonies, as opposed to controls. In first year natural cell colonies, drone production was not as evident. In a previous study, (Seeley, 2002 Apidologie 33:75-86) colonies with 20% drone comb were found to gain half the weight of control colonies and produced more drones. 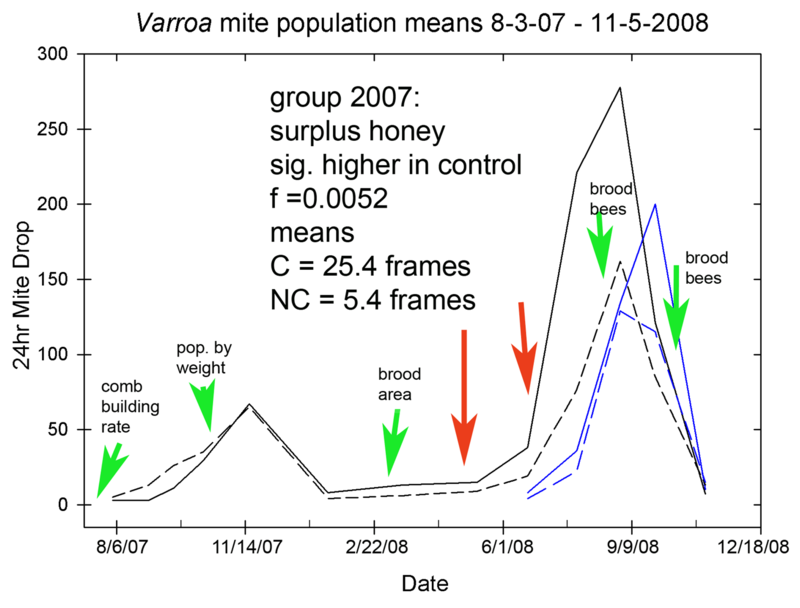 At Larry Chadwell’s location, varroa mite levels did not differ significantly between control (27± 22.46; mean ± s.d.) and natural cell hives (24 ± 20.29; P = 0.5463) in the first year. Control colonies were stronger by weight in kilograms (49.1 ± 4.54; mean ± s.d.) as compared to natural cell (35.78 ± 4.21; P = 0.0026). The weight of control colonies was adjusted to account for the additional plastic foundation. The bees in the natural cell colonies did not move up well into the second deep, while the hives with foundation moved up and completed the combs in the upper box. Combs that were built in the upper boxes of natural cell colonies was mostly drone comb, some of which was not straight in the frames. The combs in the first box of natural cell colonies were built well. This was also observed at Michael Wilson’s location. The combs in the first box without foundation was mostly worker comb, but as they moved up into more boxes, and the season progressed, mostly drone comb was constructed. 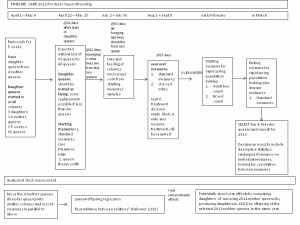 The drone comb trapping trial was added in spring 2008. In his opinion, he found it to be economically feasible and a good fit in his management of 50-75 colonies out of 100. He plans to expand it to all his hives in the coming season. To use drone comb trapping, he put a 2 inch strip of wax foundation across the top of a deep frame and left the rest of the frame empty. One to three frames were provided per hive. Then, during his normal spring inspection routine, he would cut out the drone cells on an every other brood cycle basis. This allowed some drone production for mating queens. Larry makes splits of his colonies for resale, so he is in them about once a week during the spring before queens are shipped to make splits with. During these inspections he is doing swarm control and making splits from colonies with queen cells. Drone cells were consistently built in the empty frames below the wax strips. This is due the preference for bees to build 17 ± 3% of drone comb in natural colonies (Seeley 1976 Insectes Sociaux 23:494-512). From the results above, it is clear natural cell beekeeping is not a successful method to control Varroa mites in small scale, commercial apiculture. In addition, the increase in management and decrease in honey yield, probably due to excessive drone production, is not compatible with profitable beekeeping. However, drone comb trapping is a proven method for organic mite control and can be successfully and efficiently applied by beekeepers managing 100 colonies or less. EXTRA EDITORIAL: Did colonies with or without foundation draw comb faster? Anecdotally, the colonies with foundation built more comb and built it faster. Especially as they moved up, and especially during the main honey flow when surplus honey was stored. Data I collected however, is mixed, indicating there is more to the story and that I didn’t collect all the data needed to show this. The strongest evidence that colonies on foundation build faster is in the significantly higher honey yields in colonies with foundation. And that overall, significantly more comb was built by control colonies (100% ± 0, mean ± s. e.) as opposed to natural cell (87% ± 5.78; P = 0.0492). However, if you look at data I collected during the first year of test colony establishment, its harder to tell that this is the case. I’m convinced colonies build up quicker with foundation overall, but in the first box of new colonies where the colony is expanding mostly horizontally, I think their growth is about the same, or might even be quicker in foundationless, for just that first 10 frame box or 5 frame nuc, if you start them in a nuc. If you don’t mind some extra drone comb and time with management, try it and see, but clearly (to me anyway) as they build up in more boxes, foundation is a very, very good thing for getting more combs built. But, I don’t think you will slow your bees down using foundationless in the first box, only. I measured the percentage of a full hive (3 medium supers) about every 10 days. During this time, there was no significant difference in the amounts of comb built. However, you can see how the natural cell colonies appeared to build comb quicker initially. Over time, the colonies with foundation seemed to build comb quicker. 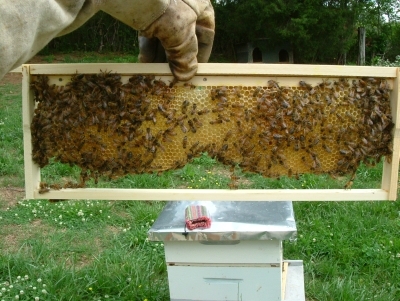 After each observation, undrawn frames were moved between drawn frames to encourage comb building as recommended by natural cell beekeepers on beesource.com. The rates in which frames of comb were built per day are compared here. 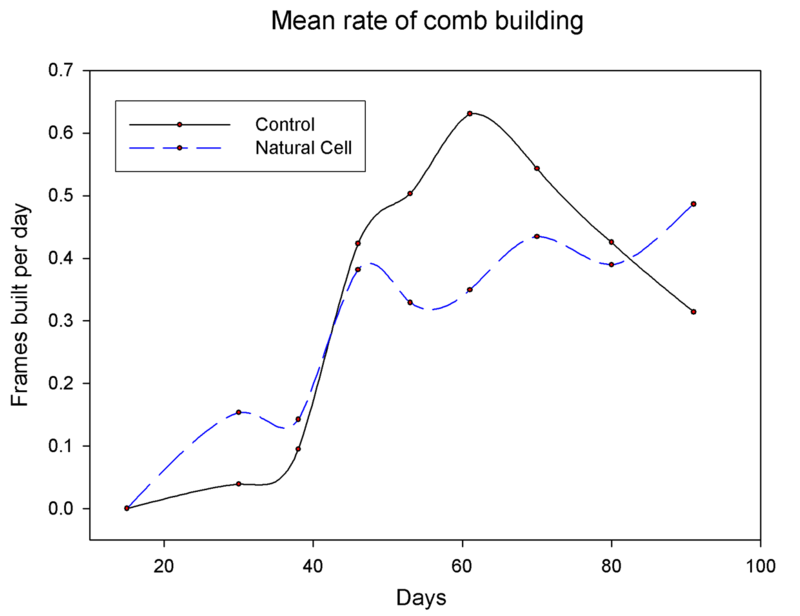 I found no statistical difference in the rates, but control colonies had a single rise and fall in rate, where the natural cell colony’s average comb building rate went up and down multiple times. This study did not produce results that show natural cell beekeeping as being a beneficial practice for beekeepers. However, it did produce results that question an accepted understanding of Varroa mite population growth. 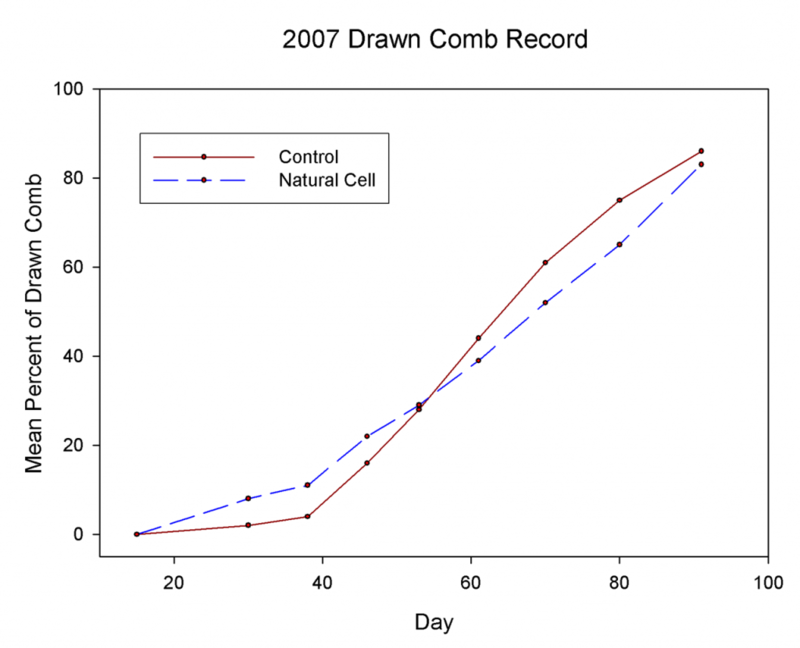 The main difference in makeup of natural cell and control colonies was the percentage of drone comb. Drone production is understood to increase Varroa mite populations in hives (Seeley, 2002 Apidologie 33:75-86). This is due to the fact that one female mite can produce more offspring in drone cells then she can in worker cells (Martin 1994 Exp Appl Acarol 18: 87-100). However in this study, the colonies with more drone comb produced fewer mites. This result only occurred in the second year of the group 2007 hives, but it is likely that this was the only situation where much larger amounts of drones were being produced by natural cell colonies. During the first year of natural cell hives, mostly worker combs were developed initially, and then as the season progressed, drone comb was built in the form of honey storage comb and filled with nectar. During the colony’s second season, the bees had eaten through the honey during the winter making the drone size comb available to rear drones. So, during the period with the greatest potential for natural cell colonies to rear the most drones, fewer mites were produced. When the natural cell colonies had the least potential to rear drones, their mite levels did not significantly differ. The natural mite fall method records total mite population per hive. The strength of the hive affects the amount of mites in the hives. Stronger hives will have more mites, since there is more brood for the mites to reproduce in. This study did not record a difference in the strengths of natural cell hives as opposed to control colonies ‘per se’, but a short term difference in strength may have been missed, during the peak drone rearing season. If it takes more energy to rear drones then workers, there may have been a short term reduction in hive strength in natural cell colonies. Or, the potential for worker production may have been decreased in natural cell hives due to the limited amount of worker comb, compared to control colonies. It would be beneficial to continue similar work to more directly ask, “What effect does drone comb have on colonies” and, “what is the optimal amount of drone comb that balances benefits and costs”. It is clear in this study that a large amount of drone comb significantly reduces honey yield. This was also observed by Seeley 2002. Understanding the effects of drone comb on colonies is important because drone comb is recommended for Africanized Honey Bee mitigation by flooding the area with European drones. 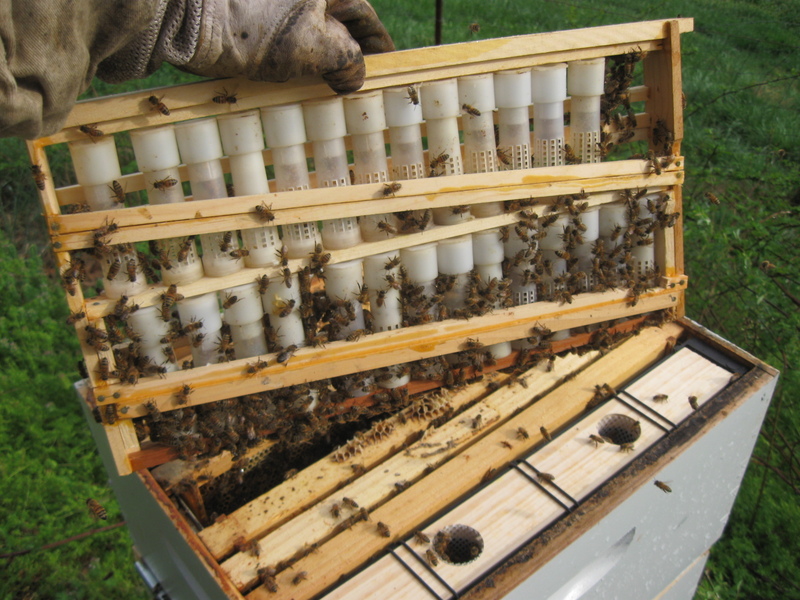 Drone comb is also used for drone comb trapping, but beekeepers may wonder if they are doing more harm than good if they don’t have time to destroy the drone comb, and mites inside, before they emerge. Drone comb is also necessary for queen rearing. It is well understood that plentiful drones are necessary for proper mating of queens. However, does the perception of more Varroa mites reproducing in drone cells, due to the higher reproduction rate, limit the use of drone comb for the above benefits? And, what is the optimal amount of drone comb as it relates to cost and benefits? EXTRA: DISCLAIMER: Since I completed this experiment, general understanding in accurate measurements in varroa mite populations in hives has developed considerably (or maybe its just that my understanding has increased). You should consider that 24hr mite fall is NOT a very accurate measure of colony mite population, UNLESS, you also closely relate it to bee population. I did related it, but not in the best way. So, take the evidence that drone production isn’t that big a deal to overall mite population growth with a grain of salt. But for me, I simply don’t worry about more (or less) mites growing in drone cells. I try and keep at least one medium frame, or half a deep of foundationless, in all my colonies to encourage some drone comb for breeding purposes. Neither Michael Wilson nor Larry Chadwell adopted natural cell beekeeping. Both are eliminating the natural cell hives from their apiaries spring 2009. Also, neither plan to use small cell foundation in their hives in the future as the bees do not readily use it correctly. And, because other studies have come out recently showing the failure of smaller comb cells to decrease Varroa populations (Berry 2009, in press; Ellis 2009 Exp Appl Acarol. 47:311-6; Taylor 2008 J App Res 47:239-242;). It is clear that natural cell beekeeping increases labor, reduces honey yield, limits the amount of worker comb that can be used for making marketable nucleus colonies, does not prevent surpassing economic thresholds of mite populations, and does not prevent colony death from mites. However, both Michael Wilson and Larry Chadwell are adopting drone comb trapping as an organic method for mite control. The experienced gained from using starter strips instead of foundation has shown how bees easily build drone comb on their own. Drone sized foundation is advertised and sold for drone comb trapping, but this study shows plentiful drone combs can be built without having to use drone sized foundation. During spring inspections for swarm control, and when making spring splits, capped drone comb will be culled to reduce mite populations. Due to the fact that capped drones will be removed when it is convenient instead of on a strict schedule as defined in most drone comb trapping schemes, it is likely some drone production will go unchecked. However, our study shows unchecked drone production should not increase mite populations. Some concern exists for reducing honey yield, but this should be remedied by reducing the amount of drone comb to the previously recommended 10%, instead of 30% at Michael Wilson’s location, and removing capped drones when possible. Removing capped drones will reduce the cost of drone production on colonies by preventing the drones from becoming adults and consuming honey through adult hood. Drones do not forage, but instead consume hive honey and take mating flights, which could explain some of the decreased honey yield in drone producing colonies. 2015 Drone Comb Trapping update: The practice of culling drones was eventually halted in both operations due to the need of plentiful drones for mating purposes. A trial was conducted on natural cell beekeeping, comparing colonies with wooden starter strips to colonies on standard sized foundation. Colonies without foundation are reported to have fewer problems with parasitic, Varroa mites, due to smaller cell sizes. It was found that after 3 years without the influence of foundation, natural cell colonies drew out cells slightly larger than bees on standard 5.4mm foundation. Natural cell colonies produced significantly less honey, probably due to a significant increase in drone sized comb (%30 n.c., %1 with foundation). Varroa mite populations did not differ in the first year of colonies, but in the second, significantly fewer mites where recorded in natural cell colonies. This was surprising considering foundress mites can produce more offspring on drones. No significant difference in the population of the control and test group was recorded. Natural cell and control colonies exceeded economic thresholds for Varroa and experienced colony death. At another location, 1-3 frames without foundation per colony were used in 75 out of 100 colonies to test out the feasibly of a large scale use of drone comb trapping, a proven technique to control Varroa mites. The methods used for drone comb trapping, in this case, fit very well with existing management practices in these apiaries. It was decided that drone comb trapping is economically feasible in similar beekeeping operations with about 100 colonies. Based on our results, we recommend drone comb trapping for organic Varroa mite control and do not recommend natural cell beekeeping for mite control or profitable beekeeping. 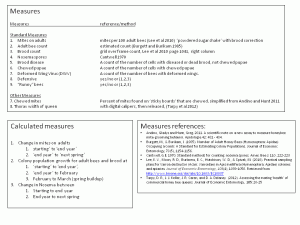 Below is an abstract from a presentation I gave at the 2009 American Bee Research Conference. It was published as part of the proceedings in the American Bee Journal. Some beekeepers have proposed that 5.4mm foundation alters the biology of honey bees in a way that increases Varroa mite populations (Beesource.com). As a part of the idea, termed ‘natural cell beekeeping’, it is reported that bees build smaller cells when managed without foundation. To test this idea, beehives were managed with starter strips by turning the wedge of a ‘wedge top’ frame on its side and applying a bead of wax. In 2007, ten colonies were started from splits of natural cell colonies. Five control colonies used standard wax foundation and five natural cell colonies used wooden starter strips. In 2008, these ten colonies were observed another year, while ten new colonies were made from splits. Five control and natural cell colonies were split from their respective groups. The ten group 2007 hives and ten group 2008 hives were allowed to build up to 3 medium boxes. When applicable, honey supers were provided above a queen excluder with drawn comb and foundation. Mite populations were recorded as 24hr natural mite fall averaged over 3 days. During colonies’ first year, mite levels did not significantly differ. However, during the second year of group 2007 colonies, mite levels were significantly lower in natural cell hives (60 ± 11, mean ± s.e.) than in control hives (114 ± 22; P = 0.0004). Despite these lower numbers, hives in both groups surpassed economic thresholds and experienced colony death. The reason for the lower mite levels appears unrelated to worker cell size. Control colonies had a worker cell size of 5.3mm ± .004 (mean ± s.e., n = 493) while natural cell colonies had a worker cell size of 5.4mm ± .008 (n = 381, P ≤ 0.0001). Cells of natural cell colonies did not decrease in size between 2 years (2007) and 3 years (2008) of management without foundation. 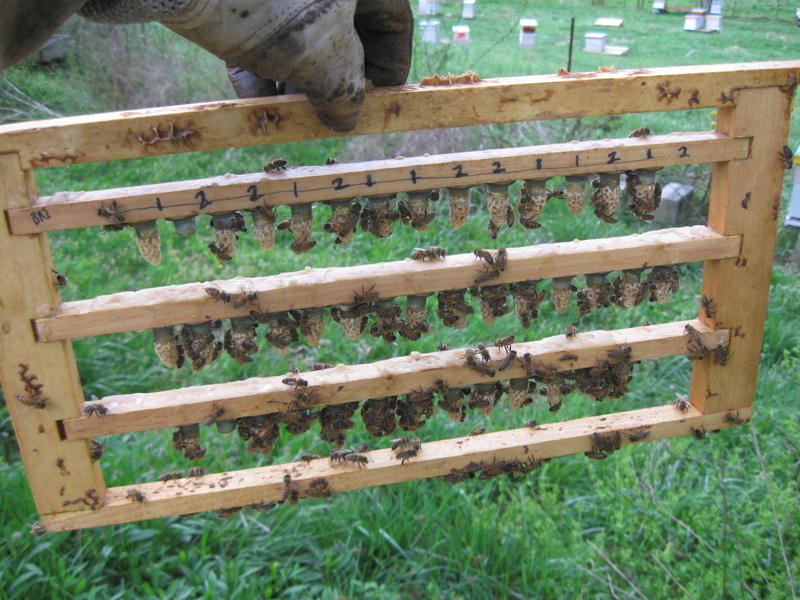 The average strength of group 2007 colonies did not significantly differ when measuring the rate of comb building in spring 2007, the hive weight in summer 2007, and the area of bees, brood, pollen and honey in the brood chambers during spring, summer, and fall 2008. However, there was significantly more surplus honey produced by control colonies (25.4 frames ± 3.9, mean ± s.e.) over natural cell colonies (5.4 frames ± 3.5; P = 0.0052). This difference may be related to the greater amount of drone comb produced by natural cell colonies (33% ± 3.5%, mean ± s.e.) as opposed to control colonies (1% ± 0.2; P ≤ 0.0001). Plentiful drone production was evident in the second year of group 2007 natural cell colonies, as opposed to controls. In first year natural cell colonies, drone production was not as evident. In a previous study, (Seeley, 2002 Apidologie 33:75-86) colonies with 20% drone comb were found to gain half the weight of control colonies. Seeley proposed the reduction was due to energy costs associated with raising drones, along with possible increased Varroa reproduction. This study suggests that an increased mite reproduction rate in drone cells (Martin 1994 Exp Appl Acarol 18: 87-100) may not increase total Varroa reproduction in drone producing colonies. 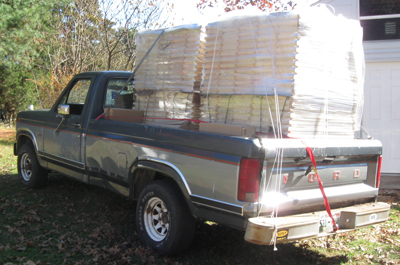 Pulled in the driveway the other day with nearly 3,000 pounds worth of beekeeping equipment. Luckily, my dad helped with his truck as well. This last delivery fully stocks my beekeeping supply garage. I now have extra of just about everything I use, so if you need to stop by in Clinton, TN to buy some equipment, or pickup at the next Anderson County Beekeepers Association meeting, just let me know. Price list. 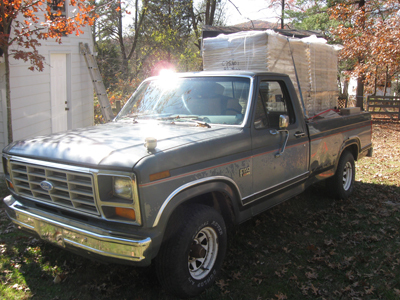 Here is what my bee truck looks like with 1,000 assembled frames and 1,000 one pound honey jars. The cab was stuffed. Next time, I’ll use side boards for loose boxes. All you can really see in the pic is the frames. This is a long bed truck, which is handy since it will fit two standard size pallets and you can still close the tailgate. I just gave it a wash before setting out. Looking for my old blog at my4acres.com? I’ll be putting new blog posts on this site, but for previous blog posts I have those archived at this link.